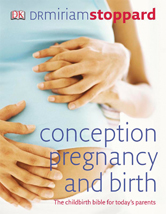 Widely accepted as the definitive guide to pregnancy and childbirth, Dr. Miriam Stoppardâs Conception, Pregnancy, and Birth has sold well over a million copies since it was first published. This new edition has not only been given a completely new look with stunning new photography but it has also been updated and re-written with 20-25 percent new material. New information will cover the latest developments in pregnancy and birth, from up-to-date research on how your stress levels can affect your unborn baby to new developments in delivering your baby.